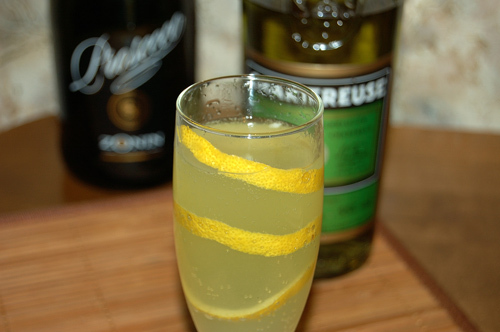 This short post is about cocktail combined flavours of unique French liqueur Chartreuse, lemon juice and sparkling wine. There are two popular type of the liqueur – green and yellow, either of them is great in cocktails, and my story is about green Chartreuse, magnificent aromatic spirit with stunning strength of 55% ABV. This factor is the cause why the liqueur has became base spirit for Chanteuse cocktail. Mixed with champagne and lemon juice, green Chartreuse offers complete solution in creating a cocktail with unique aroma and proper strength. I’ve found this piece of state-of-the-art mixology at Married… with dinner blog and as far as I understand Anita and Cameron, a couple behind the blog, are the people who invented Chanteuse. Rare, little known and local spirits can bring cocktail experimenters to excited state. Often they have a peculiar taste. Definitely they add special ethnic flavour to well-known drinks. Also they help to obtain important experience in work with new spirits and understanding how to use them properly in cocktails. 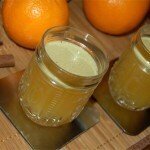 Current «Mixology Monday» event is about similar topic. «Favourite niche spirits» is the theme for it, and the present MixMo hoster Filip from Adventures in Cocktails wants to see us making cocktails based on the «niche spirits» which are not from «Big Six»: whisk(e)y, rum, gin, vodka, tequila and Cognac. Well, what a spirit to choose? Calvados, Armagnac, genever, kirschwasser, akvavit? Due to my Russian origin I should prefer samogon, an old Russian spirit which later became similar to American moonshine, but since ancient times is produced by many home distillers with a good quality – better than most vodka brands of today. 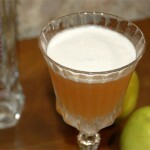 But recently I was in experiments with Bavarian apple and pear schnaps so the story how I got it was fresh in my memory. Once I’ve bought it in a souvenir shop when I visited a small village in Bavarian Alps. Also there was transparent spirit in a bottle with blue flowers on the label. «Oh, Enzian Schnaps (gentian schnaps)» – venerable shop owner told me when I’ve pointed at the bottle and asked what a spirit is it. Certainly I’ve bought it too! For me, Old Fashioned cocktail is a pure inspiration. I love it made in traditional way with bourbon and also I love to tweak a bit the cocktail’s classic recipe. My first post is dedicated to normal Old Fashioned. Current one is about all Old Fashioned variations I love so much. In my work I applied two basic methods: a) to change a spirit and b) to replace (partially) syrup with a liqueur. Additionally I was trying to combine various bitters and extracts. 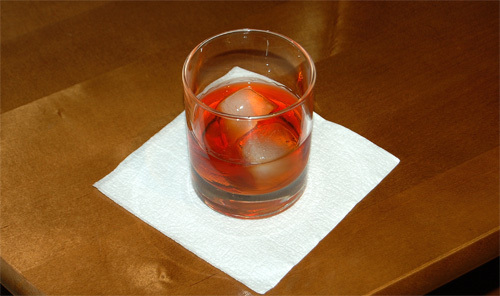 Another method is to mix two or more brown spirits. In my opinion that’s a tricky way and today I feel I’m not ready to go in for these experiments. 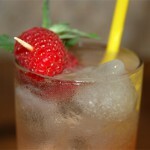 Now I just adopt another bloggers’ practices, and my latest effort was theSpeakista’s cocktail called Final Five. That’s not Old Fashioned but I dare suppose it a cocktail in Old Fashioned style. In any case, I’ve made two cocktail in similar manner and wrote about it below. 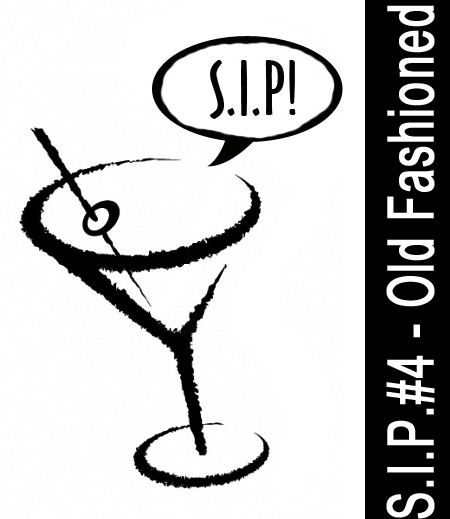 Old Fashioned cocktail is the topic for the fourth round of our online imbibers party called S.I.P. For me, this drink is an essence of cocktail culture. An icon. Or a symbol. I prefer gin-based cocktails but when I have no idea what to drink tonight usually my choice is not Dry Martini but Old Fashioned. I love his strong character and his dry and sweet flavour. I love to make Old Fashioned, this simple procedure calms emotions and creates special atmosphere. Old Fashioned is an immortal classics and an inspiration for creative boozing. And that’s enough. Stop talking, take a bottle of whiskey and bring yourself down to make the cocktail. Tags: homemade, I love it, S.I.P. Another cocktail with Van Gogh Açai-Blueberry Vodka I’ve created after unsuccessful efforts to discover original cocktails with this hard-to-find vodka. I was trying to produce a berry-flavoured light cocktail with strong herbal background. Hope I succeeded in my attempt. Surprisingly the hardest thing was not to achieve the best taste but to get acceptable appearance. 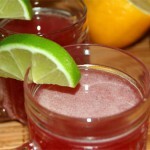 Van Gogh Açai-Blueberry Vodka has wonderful lilac color but lose it completely after mixing with citrus juices. Happily, Parfait Amour liqueur helped me to keep the original violet color with steel-blue tint. Our third S.I.P. event is dedicated to another cocktail icon called Manhattan as well as its numerous variations made with other whiskey (whisky) and vermouths (or aperitifs and maybe amari). 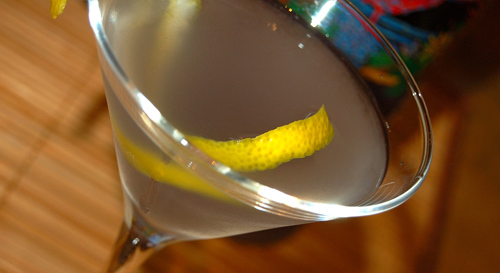 For me, Manhattan is a counterpoise for Dry Martini. Warm, sweet and spicy side of cocktails against dry and bitter world of clear and cold gin flavoured with drops of vermouth. 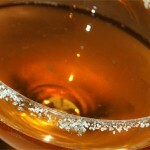 Brown spirits versus crystal clear alcohol, Alpha and Omega of cocktail world. I’m not interested in stories about Manhattan. I just enjoy it when I get tired of other cocktails – classic of modern, it doesn’t matter. Manhattan is the special mood, the atmosphere of calm and confidence. The never-ending experiment with whiskey and vermouth pairing. The search for the best additions – bitters or liqueurs. Much attention to details, technique improvement. Careful sipping, enjoying aroma, appearance and taste. It’s a more than cocktail, almost a lifestyle. I’ve learnt about Tuxedo cocktail from David Wondrich’s Esquire Drink Database. So I thought that it’s made exclusively with sherry. Once enjoying Tuxedo with genever and dry sherry, I started to search for more information about this cocktail. To my shame, it appears that Tuxedo was a well-known and popular cocktail in the first half of 20th century. The oldest source I could find, Harry Johnson’s «New And Improved Bartendes’ Manual» described Tuxedo as a cocktail with French vermouth, not sherry. Later sources, «The Savoy Cocktail Book» and «Approved Cocktails, authorized by UK bartenders guild» also mentioned Tuxedo with vermouth. Moreover, «The Savoy Cocktail Book» contains two Tuxedo versions. This is another cocktail based on Scotch single malt whisky. Scotch blended whisky isn’t classic cocktail component because of many reasons. Single malt whisky has much more reasons not to be widely used in cocktails. 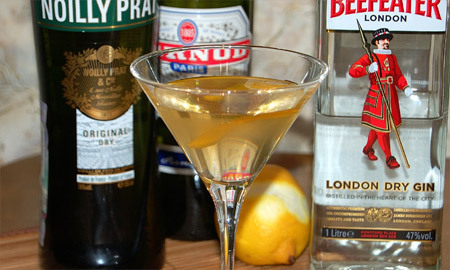 It remains as exotic tool for innovative bartenders and mixologists, something like bitters. I’ve learnt about Albannach Renaissance at Gin, Not Vodka. 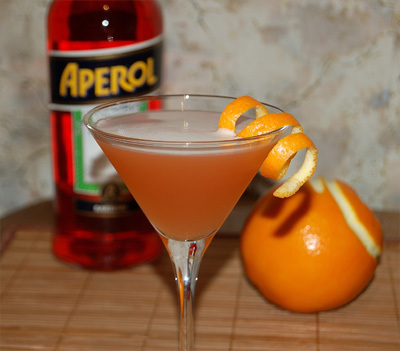 The cocktail based on combination of peaty Scotch whisky and Italian aperitif Aperol. As I understand, the title for the cocktail has been taken from the name of the restaurant where the author Vytautas Jurkus works. 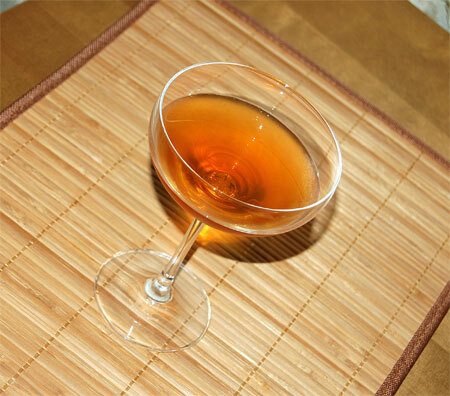 At first I was in a hurry and flippantly substituted Campari for Aperol and Bowmore Legend for Ardbeg Renaissance. I don’t think that my first Albannach Renaissance cocktail was good. But it was the thing which I remembered as something special and exotic. I’m continuing with my Scotch whisky experiments. Now I’m about to learn Borden Chase, one more cocktail based on wonderful combination of Italian vermouth and Scotch whisky. This cocktail should be called Rob Roy variation but if it were not for pastis. With pastis and orange bitters, this cocktail turns to something unique. Yes, there are Rob Roy Holiday Style and Bobby Burns with lightly anise-flavoured Drambuie and Benedictine, respectively. And there is almost identical Robert Burns Cocktail. But at first I’ve known it as Borden Chase at David Wondrich’s Esquire drinks database. Both Drambuie and Benedictine work perfectly with whisky so I thought that pastis’ strong anise note could be nice addition to Scotch whisky flavour.